Salomon's Shogun moves away (slightly) from the powder specialization of big-brother Czar toward a more classic all-mountain design, modernized with just a touch of rocker. Compared to the Czar, sidecut is deeper and turn radius is tighter. You'll notice this right away on groomed snow, as the Shogun brings a nice, traditional feel to your on-trail experience, with snappy quickness from edge to edge, predictable edge grip, and carving confidence. In that way, the 99cm-waisted Shogun is very much in the Volkl Mantra cohort: an all-mountain plank offering plenty of flotation when the snow gets deep. Compared to the Mantra, the Shogun does offer a more modern build, with just a touch of tip rocker to add flotation and make turn initiation easier in powder, and twin tips to keep the park rats happy. 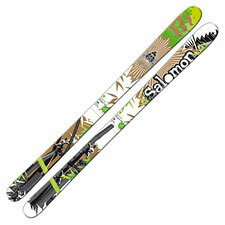 I must say Salomon has done a nice job with the Shogun's subtle touch of tip rocker. The ski transitions easily from deep snow to groomed runs to bumps and back again, feeling right at home wherever you are. The addition of more sidecut to the Shogun does reduce its crud-busting ability compared to the Czar, and in terms of pure powder experience, the Shogun can't match the Czar in deep snow either. This is an inherent limitation of the all-mountain concept: you get a generalist that does many things well, but is bested in specific categories by the specialists. That said, if circumstances (ie, Reality) prevent you from having multiple pairs of skis with you wherever you go, the Shogun offers a very nice compromise for a big mountain, powder-capable ski—just like the Mantra. I wasn't able to test the Shogun on true hardpack conditions, such as ice, but I'm going to guess the rockerless Mantra is a little better at setting an edge in hard snow. Conversely, I have skied Mantras in powder, so I feel a bit more confident giving the nod to the Shogun when the snow gets deep. So lets call the Shogun a powder-tilted Big Mountain/All Mountain ski, with plenty of quickness and liveliness to keep you happy on the groomers. As with all skis in this cohort, you are trading away ultimate performance in any given context for all-around versatility, but the Shogun makes its compromises gracefully, maintaining an active, energetic ride wherever you go.